Even though she didn’t like poetry in her younger years, Rockford-native Christine Swanberg developed a passion for the craft later in life. Step into her journey from novice to award-winning poet. Christine Swanberg didn’t grow up dreaming about writing poetry, yet hearing her describe the circuitous path that led her to become an award-winning and nationally known poet makes it clear she had little choice in the matter. Poetry chose her. Born in Rockford, Swanberg’s family moved to Wisconsin and then to Iowa as her father pursued his master’s degree, eventually returning to Rockford where she attended public schools. Swanberg’s interest in poetry waned as she grew up, replaced in large part by a fondness for reading – novels and biographies were her favorites – and writing. After graduating from Guilford, Swanberg earned a B.S.Ed. in English, speech and drama from the University of Wisconsin-Whitewater, and later received her Master of Arts in Teaching from Rockford College (now Rockford University). Shortly after leaving Whitewater in 1972, Swanberg returned to Rockford and started teaching speech and drama at East High School. When a new creative writing teacher was needed, she took over the class. Before long, teaching creative writing had rekindled her love of poetry – modern poetry, to be precise. Swanberg still views that creative writing course as a highlight of her teaching career. During a sabbatical in 1984, Swanberg’s destiny began to clarify when she studied different types of writing at Northern Illinois University. “My objective that year was to see what I was meant to write,” she says. “I took poetry with Lucien Stryk, I took fiction writing and I took playwriting. I wrote some pretty good short stories – one of them won an award and a couple got published – but to my complete and utter surprise I realized the skill set needed to write modern poetry was what I had. She soon began refining those skills by writing and submitting her poems. Swanberg credits beginner’s luck with her success, but her own tenacity played a big part, too. “I wrote a sonnet called ‘An English Teacher’s Sonnet.’ I sent it to English Journal and they accepted it, and it became their promotional postcard, which I didn’t find out until I got back from the sabbatical,” she remembers. Around the same time, Swanberg was approached by Frank Schier, a fellow poet and the owner of The Rock River Times. He died in 2017. Swanberg noticed Schier passing the hat at each gathering and asked why he was collecting the money; he said he wanted to publish the work of one of the writers. Several of Swanberg’s poems had been published that year in Chicago’s Lucky Star magazine, and she knew the publisher, Henry Kranz, occasionally published chapbooks. After leaving East in 1987, Swanberg joined the faculty at Rockford Career College, where she taught until 2000. She believes working full-time while writing poetry helped make her art better because she had to commit much of her free time to writing poems and participating in readings, workshops and residencies across the country. Her work has been published in countless literary journals and poetry anthologies, and her latest book of poetry, “Wild Fruition,” is her second book published by Puddin’head Press. Given her long list of publication credits, it may seem strange that Swanberg doesn’t adhere to any sort of publishing schedule. “I’ve had years where two books have come out, and I’ve gone seven years without a book,” she says. Her poetry style has matured over time, as well. 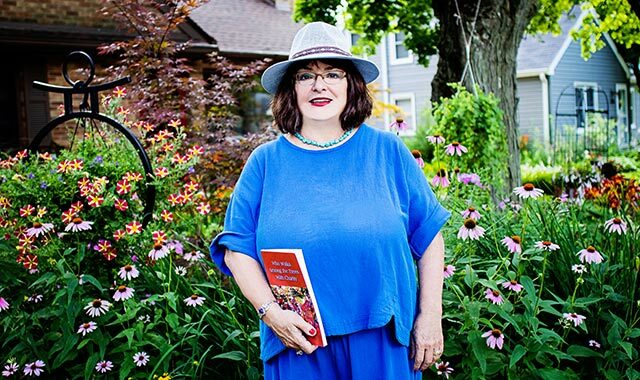 Swanberg still teaches at poetry workshops and residencies throughout the Midwest and beyond, but for many years she’s mentored new poets through salon-style poetry groups that meet in her Rockford home. “Even though I may have gotten some attention as a poet, I think I probably am a better teacher,” Swanberg says. Although no longer teaching in public schools or at Rockford Career College, Swanberg still finds ways to teach. Poets tend to be reflective, and Swanberg is no different. and parching bi-polar seasons, distressed. where once the creatures that she loved prevailed. frenzies, insatiable, in black swarms. and turns from black to gray, a cracked mirror. now the gardener stoops too full of goodbyes. Goodbye monarch, swallowtail, and bees. for a decade or a century to bear. The gardener sees, feels, and knows the cost. but to the gardener, it comes as no surprise. This entry was posted on Friday, August 17th, 2018 at 12:00 pm	and is filed under Arts & Entertainment, Top Posts. You can follow any responses to this entry through the RSS 2.0 feed. Both comments and pings are currently closed.